Phyllis Sues—who just turned 94—has been a dancer all her life. She performed in five long-run Broadway shows and danced with the Ballet Russe de Monte Carlo. She also performed and starred in TV shows. At 50, she started her own women’s fashion label, which ran successfully for 22 years. In her 70s, she learned French and Italian and became a musician. She produced, composed and plays the piano in a tango & jazz CD. In her 80s, she flew on a trapeze and walked into her first yoga class at 85. 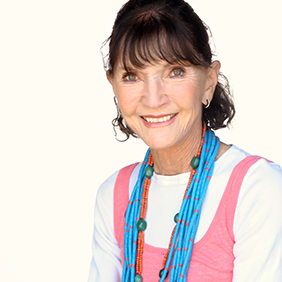 That class changed her life, proving that even in your 80s, you can make positive lifestyle changes. Thanks to yoga, Sues is able to continue her true passion: dancing. To celebrate her 90th birthday, Sues—like George H. W. Bush at the same age—skydived. She loved it so much she went back a second time. Sues practices yoga and dances daily. She also hikes with her dog, jump ropes, rides her bike, and plays tennis. For her 92nd birthday, she celebrated by dancing a tango, which she credits for keeping her memory sharp. Her yoga teacher posted the video, and it went viral with over one million views. Even though Sues has arthritis and osteoporosis, she does not allow either of them to be active members of her life. And neither is cancer, which she conquered at age 79.
Who says social media is not for older adults? Sues is active on social media and posts inspirational and wise advice to her followers. She has inspired many to take a dance class, practice yoga, and exercise. “The response has been incredible,” Sues said. Sues is featured in Ari Seth Cohen’s new book Advanced Style: Older and Wiser along with a personal essay sharing her lifestyle secrets and showcasing her senior-chic style. Dispelling the myths of aging is an everyday occurrence for Sues. She is definitely inspiring others to keep moving … no matter what their age. What is the motivation for living? What is the motivation for getting out of that bed? What is the motivation for looking good? What is the motivation for feeling good? What is the motivation to accept each challenge? These questions plague the universe, but there is a way. I’m motivated, because I cannot face the possibility that my body and mind will be any less tomorrow than it is today. And I have pride, energy, and endless desire to be better not just tomorrow but every day. I only have me, and that’s all each one of us has. No one is going to do it for you. You and you alone are the engine. To be inspired is a dead end unless you do something about it. To be inspired is one thing. To do something about it is another thing entirely. To have the desire is one thing, but it goes nowhere unless you take action. Inspiration, desire, and action—all three together make a life worth living. Take a deep breath and enjoy the silence that comes with deep breathing, and it’s possible you may discover a seed of creativity hidden away— it needs to be awakened. I have enjoyed an amazing life, never doubting or anticipating where the journey was going to take me. Only loving every minute on this planet, never questioning until one day at age 85, flying on the trapeze, I questioned the word gravity and how was I flying with absolutely no assistance except my own physicality. And this gave birth to my first song “FREE FALL,” which gave birth to many more songs lyrics and music and a CD, Scenes Of Passion. Writing lyrics and composing music had never been on my agenda. It has to do with opening doors and accepting what’s on the other side. Facing the challenge. It’s out there for every one of us. It’s like taking that deep breath and listening. It’s not a secret. For me, once the lyrics and the music evolved, something else said, “Hello.” It was my body demanding to be heard. For 22 years, I had neglected this incredible machine. My brain was the one feeding a successful fashion business. Now, it was time to allow my best friend to take flight. And between the two of us, we have been on a totally unexpected journey. Yoga then tango then music composition not to mention jumprope. So now, for more than eight years since my 85th birthday, I’ve been feeding and encouraging these two phenomenal organs. Between the age of 20 and 93, there are differences, minuses, and pluses, but the only ones I like to think about are the pluses. At 20, there is no fear. At 93, there is fear but a different kind of fear. Knowledge educates fear. You acknowledge the pitfalls because of this well-earned wisdom, and you know exactly how to handle not only the fear but also the anxiety. 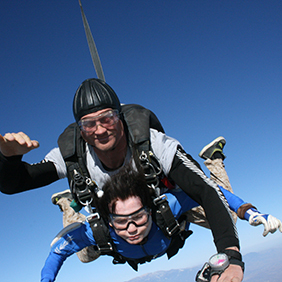 When I skydived, I had no fear—I had anxiety. The desire was there, and the action followed. I had to go twice to make sure the universe and I were one. So now all these 93-close-to-94 years of moving, learning, simplifying, listening, and simply living are paying off. Be thankful for this gift of life. Is it just today? Or is it forever? So many questions and no answers. But there is one answer, and that is without a question. You are here now. Not before, not after. Simply this exact moment. Call it what you may, but if you can enjoy this exact moment and every moment, you have won the brass ring. It’s called the present. I’m not going to say this is easy to achieve. I’ve been working on it for years and once in a while, I touch the brass ring. If you can truly achieve the present, then there is no end and every moment is a treasure and simply living becomes easier. Writing my biography only happened recently and is an ongoing project. So we all know anything is possible if you think it’s possible. The word possible opens up endless avenues of creativity. If it’s only, and I say only, in the kitchen, that can be one hellava opening for creativity. Tango gives me hope for everything. Yoga gives me strength for everything. Riding my stationary bike for 20 minutes is not the most exciting 20 minutes in my life, but it gives me strength and aerobics, and life gives me the universe. Just staying alive is a never-ending challenge. A challenge to move to breath, to learn and grow beyond your comfort zone. Then and only then will you enjoy a life of quality. Take a day at a time, simplify, relish, and cherish each moment of being alive. This life is a gift. There are so many rewards, but they come with the challenges and your acceptance of those challenges. So grab ahold of that wire of life, and the chips of life will fall in your lap. Move, listen, learn, and simplify. There’s your motivation, and you’ve just awakened the seed of creativity.